With Memorial Day announcing the beginning of beach days and the official start of summer right around the corner, it’s finally time to dust off the grill for barbecue season. Now admittedly, it’s easy to get stuck in BBQ chicken and grilled steak ruts. But hey, life’s too short. Not you. Not this summer. Put your game grill face on. Turn up the heat (and the music.) Dance like nobody’s watching. And show me your grillz…because things are about to get hot in here. 2. Star Side Dishes. If summer were a language, there’s no doubt that grilled corn would be a part of the alphabet. A staple of county fairs far and wide, corn fares well on the grill, especially when sprinkled with a little Old Bay Seasoning or dill. If corn isn’t your style, grilled artichokes make a wonderfully earthy stand in—dapper and warm-hearted as a vegetable can be. 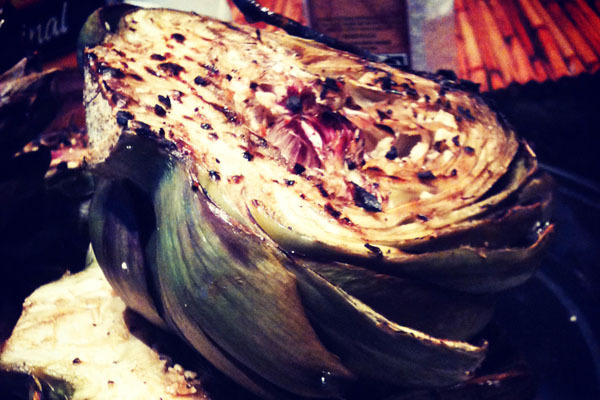 Hugged with a salty, garlic EVOO glaze, grilled artichokes are totally capable of stealing the BBQ spotlight. If artichokes are a bit too prickly for your lovin’, go hipster-trendy with a grilled Caesar salad. Smokey meets creamy in an ensemble that will wow guests, exalting you to the status of some devilishly attractive celebrity chef. Rumor has it that freshly grilled croutons will even earn you a Golden Globe Grill nod. 3. Skewered Kebabs. Aside from burgers, barbecuing is all about the kebabs. Skewers add a whole new level of sassiness to grilled main courses, making a meal in one fell swoop. Chicken or steak shish kebabs are obvious old favorites, but don’t hesitate to think outside of the lid. Jazz things up a bit and try a fish variation or vegetarian version of kebabbin’ this summer. Swordfish and salmon work best for sea lovers, while extra-firm, marinated tofu is a meatless foodie’s paradise. Note to barbecuers: When it comes to kebabs, you’re best off picking sturdy vegetables and proteins to ensure that you don’t end up with a bunch of singed bites all up in your grillz. 4. Summer Fruits. After meats, vegetables are the most commonly grilled items. From mushrooms to bell peppers and corn to summer squash, vegetables often receive star treatment, while fruits are left on the B-list. Well, dust off your skewers and prepare for a breakout. Tropical with a smidgen of sultriness, grilled pineapple is all sorts of wonderful. Think luau without the expensive plane ticket and hula dancers with hips that honestly don’t lie. (Hint: these fruit skewers make great birthday desserts too, when drizzled with chocolate!) In the event that you’re not feeling the p-apple, try a more sophisticated twist with balsamic-grilled strawberries. Simply place the strawberries on a skewer, brush with olive oil, balsamic vinegar, and a touch of sea salt; and then, grill on low. Don’t forget to make Gwen Stefani proud and go bananas while you wait. 5. Grilled Pizza. Like Brad Pitt, pizzas are best when hot. To achieve such a level of beauty, it is essential that said crust+sauce+cheese masterpieces be cooked in a super hot environment. No, Easy Bake ovens don’t count. But barbecues do! With a perfect crispy crust, ooey gooey mozzarella, and sizzling toppings, grilled pizza is a preview of a nirvana that tops boring grill-ables any day. Did someone say toppings–plural?! Swooooon. Italian sausage and fresh mushrooms make for the ultimate smokin’ hot experience, but an Italian hottie holds it own too with traditional thin crust stylin’, a little olive oil, and some fancy schmancy cheese. Call it pizza or perhaps just focaccia that got a Hollywood promotion. Watch out Brad Pitt, grilled pizza is a’comin for ya. Lexi Cotcamp is a rising sophomore in the Robert E. McDonough School of Business at Georgetown University, but she’s not the average business school kid. Lexi considers bonfires, barbecues, beaches, and best friends to be crucial ingredients for a great summer and plans to test that recipe accordingly.